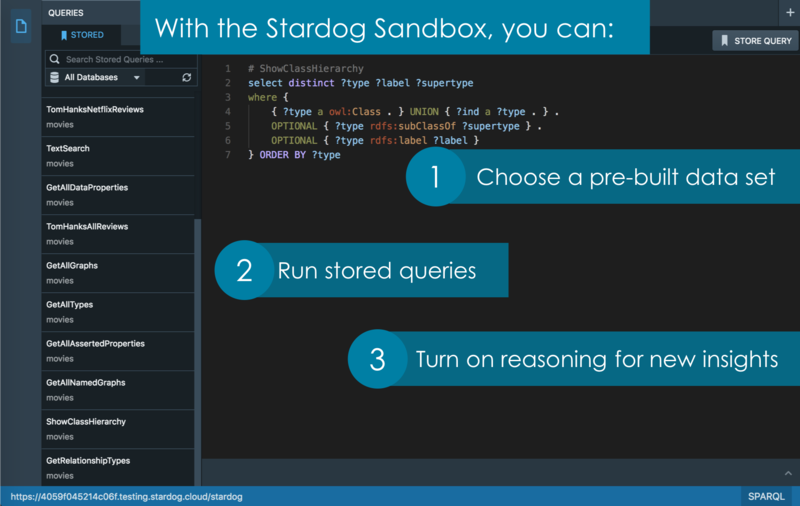 The fastest way to see Stardog in action with pre-built datasets and sample SPARQL queries. Try out Stardog without installing any software! Stardog Sandbox is a free, hosted environment and includes Stardog Studio. Perfect for beginners, our Sandbox includes pre-built datasets, sample SPARQL queries, and reasoning capabilities. Read our documentation to learn more. Finance: Explore the Financial Industry Business Ontology (FIBO) to see how financial instruments, business entities and financial processes work across the global financial industry. Movies: Explore movie release, office box earnings, and film stars and more. Clinical Trials: Explore biomedical vocabulary produced by the National Library of Medicine. Want to add your own data? Contact us with a request. Note: Google authentication is required to create a Stardog Sandbox. After clicking above, you will be re-directed to login with your Google account.